A Worx hedge trimmer can help you achieve your landscaping ideals. Because, after all, it’s the details that matter the most. A manicured property says everything about your commitment and skills, that’s why you should choose your allies carefully. Worx is one of those brands committed to empowering the hobbyist landscapers to create lush landscapes and manicured lawns with an arsenal of tools. Including their collection of reliable hedge trimmers. Find out more about them or click on the links below to choose the right one for you. Worx has launched its own line of reliable and powerful gardening tools since 2004, yet the company has been manufacturing tools for companies such as Black+Decker since 1994. Thus, the brand knew exactly how to perfection a range of reliable hedge trimmers that address the needs of all residential users. With the DIY hobbyist in mind, Worx created two lines of practical hedge trimmers designed to make shrubbery shape up nicely. All hedge trimmers manufactured by the brand are electric and divided into corded and cordless options. The cordless collection includes five power tools powered by batteries between 20V and 56V. Another difference between the models is the length of the blade. The tools come either as bare tools without battery and charger or in a complete option depending on each person’s needs. Moreover, the manufacturer offers separate sets of accessories, including batteries, chargers, and more. The collection of corded hedge trimmers include two tools. One of them has a 24-inch dual blade while the other has a blade of only 20 inches. There are other slight differences between the two tools and they address different types of gardeners. Regardless of the collection, blade, and power source, all Worx hedge trimmer have common traits. Their most important characteristic is the lightweight design. The ease of use of these tools makes hedging convenient and hassle-free. Handling the tool in all cutting positions is a breeze while the dual-action blades deliver precise cuts without worries. The design of the handle is also worth mentioning. The handle is ergonomic and designed to prevent sore muscles and blistered hands. Because the manufacturer claims that all the proof of your work must be given by your flawless yard not injured hands. The dual-action blades do more than efficient trimming. Thanks to the technology used, they reduce the level of vibrations and deliver a fluid performance. In a nutshell, Worx focuses on the high-quality development of the tools, including the latest technologies to create superior products for gardeners and landscapers. Designed majorly for residential users and DIY gardeners, these tools are easy and comfortable to handle, reliable, and made to shape your shrubs for a long time. Like we mentioned above, there are two types of Worx hedge trimmers to choose from, corded or cordless. The corded models are designed for those residential users who don’t want to worry about runtime and battery recharging. Easy to use and delivering excellent performances, the corded Worx hedge trimmers are lightweight and easy to handle in all cutting positions. Cordless models were designed for those who want to maintain their freedom of movement. Worx packs cordless convenience with reliable batteries. Extended runtimes and variable powers meet the needs of most homeowners. In the end, decide what’s most important for you between unlimited power or freedom of movement. All Worx tools are equipped with dual-action blades but the difference stands in the length. For short shrubs and hedges, a 20-inch blade might be sufficient, yet a longer blade is usually desired for tall hedges. The length of the blade also determines how fast you can finish work. Worx hedge trimmers have blades with lengths that vary from 20 to 24 inches. To choose the right tool for you, consider the type of vegetation you have. Worx has a hybrid hedge trimmer designed to address several needs. If you need the tool just to reshape your bushes, then a traditional Worx hedge trimmer might be just what you need. But if you want to keep your property neat and tidy effortlessly, then the tool with blade and shears might be more appropriate. Full details about this tool are included below and to choose the right one for you, just consider what you want to do with the hedge trimmer in the first place. With this in mind, let’s see which are the best power tools the manufacturer provides, based on their popularity and versatility. WORX WG255.1 20V Cordless Hedge Trimmer is powered by a 20V lithium battery and delivers reliability and convenience in a compact and easy to handle tool. This hedge trimmer is designed for all DIY gardeners and is easy to use by those with little or no experience in the field. This hedge trimmer is lightweight and compact. It weighs less than 6 pounds and it is easy to maneuver thanks to the wide gripping area. The D-grip handle is also ergonomic, making it easy to cut the branches in all cutting positions. The battery, on the other hand, is part of the 20V Power Share WORX system. This means that the tool can share its battery with the other tools in the system. This hedge trimmer is available with or without the battery kit. Other features worth mentioning are the over-mold soft handle and the dual action blades that reduce fatigue due to the low level of vibrations. Lightweight design: this power tool weighs approximately 6 pounds. It is easy to maneuver in all cutting positions. Shareable battery: the tool is part of the 20V Power Share system and can share its battery with all the other tools in the collection. Soft handle: the comfortable grip and soft handle are designed to provide ultimate handling comfort. Dual-action blades: these blades are designed to finish trimming quickly and effortlessly. They produce lower vibrations and provide clean cuts. The hedge trimmer works as supposed yet few users complained about receiving faulty items. WORX 32V MaxLithium 20-Inch Cordless Hedge Trimmer boasts a 20-inches dual action blade and a powerful 32V lithium battery that delivers long-lasting performance and smooth operation. The hedge trimmer is dedicated to those homeowners who need it for light and medium chores. This power tool has a high capacity and a great runtime. Despite the more powerful battery, the manufacturer maintained the low weight and the compact design. 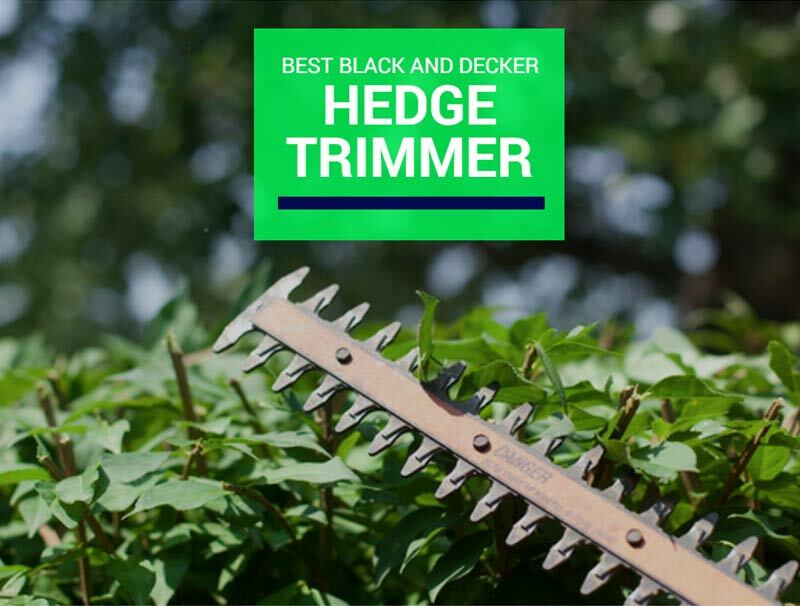 The blade, on the other hand, is perfect for short hedges and shrubs. The innovative full-wrap handle provides you with the ability to trim at any angle or cutting position, while the soft grip handle gives you an improved grip and helps you reduce fatigue. The dual-action blade is designed to reduce vibrations and increase user performance. The tool handles the most common types of shrubs and lawn hedges. Battery: this tool comes with a powerful battery that provides a great run time while maintaining its compact and lightweight features. Easy to handle: this tool is lightweight and easy to handle in all cutting positions. It boasts an ergonomic soft handle. Steel blade: the 20-inch hardened steel blade is designed to reach all areas and provide a hefty cutting capacity. Warranty: the tool is backed by three years of limited warranty. The manufacturer could improve the balance of this unit. Versatile, lightweight, compact and easy to maneuver, WORX WG800.1 3.6-Volt Lithium-Ion Cordless Grass Shear/Hedge Trimmer is the perfect gift for the gardener in you or in your friend. This power tool is designed for the enthusiast newbies and works wonders in a small yard. The tool is powered by a 3.6V lithium-ion battery that provides a great runtime, no self-discharge when the tool is not in use and no memory effect. But what strikes about this tool is the versatility. This compact tool delivers outstanding performance in all modes. It switches from a versatile hedge trimmer to a grass shear or edger in a blink of an eye, it is lightweight, compact and very easy to handle. The over-mold soft grip handle is different from the other tools in the range yet designed to provide the same improved maneuverability and reduce fatigue. Compact design: this tiny tool is ideal for the first time gardeners. It is easy to handle and provides outstanding performances. Battery: the lithium-ion battery is one of the most performing on the market. It has no memory effect, a long life and it doesn’t lose its charge when not in use. Quick conversion: switching between modes is easy and the conversion requires no tools. Warranty: the tool is backed by a 30-day satisfaction guarantee and two years of limited manufacturer’s warranty. The tool is not adaptable to heavy-duty chores. This two-in-one power tool is a corded hedge trimmer and pruner powered by a 4-Amp motor and designed to meet the needs of most homeowners. Lightweight and easy to maneuver, this tool delivers great performances and hours of uninterrupted work. In detail, the tool weighs less than 6 pounds and is easy to operate with just one hand. Regarding its performances, this hedge trimmer and pruner can handle even the demanding jobs thanks to the long dual blade. The blade is 24 inches long and has a cutting diameter of ¾ inches. The dual action blades finish the job fast and effectively, while the powerful motor keeps it up and running for as long as needed. The only downside is linked to the lack of freedom of movement. You’ll have to rely on the use of an extension power cord and pay attention to not cut it accidentally. Unlimited runtime: the corded tool will let you trim the hedges and manicure the property for as long as you like. Blade: the hardened 24-inch dual-action blade is ideal for multiple uses. You can trim the hedges and prune your trees effortlessly. Motor: the 4 amp motor delivers sufficient power to make landscaping a breeze. Maneuverability: the tool has a comfortable grip, a well-balanced center, and a soft handle. It is easy to maneuver in all cutting positions. The motor gets hot when the tool is used for demanding jobs. WORX WG268 40-volt Lithium Cordless Hedge Trimmer is powered by a 40V lithium battery and delivers reliability and convenience in a compact and easy to handle tool. This hedge trimmer is designed for all DIY gardeners and is easy to use by those with little or no experience in the field. The dual-action blade is 22 inches long and boasts a cutting diameter of ¾ inches. Thanks to this feature, the tool doubles as a pruner and will help you deal with most landscaping chores. The battery, on the other hand, is part of the 40V Power Share WORX system. This means that the tool can share its battery with the other tools in the system for unlimited power. Other features worth mentioning are the over-mold soft handle and the reduced fatigue due to the low level of vibrations. Shareable battery: the tool is part of the 40V Power Share system and can share its battery with all the other tools in the collection. There seem to be some flaws in the design of the battery. In our opinion, the WORX WG255.1 20V Cordless Hedge Trimmer is the best on the market. With DIY hobbyist landscapers in mind, we believe this tool is right for experienced and new gardeners. It is easy to handle, effortless to use and comes with or without the battery kit. The tool can share its battery with all the other Worx power tools using the same type of battery. Moreover, the battery has a prolonged runtime and lets you finish work in a breeze. The hardened dual-action blade is another noteworthy feature. With its 22 inches blade and ¾ inches cutting diameter, this hedge trimmer will help you manicure your property quickly and effortlessly. Added to the reduced vibrations and fatigue, this is an outstanding Worx hedge trimmer to consider.